This NISSIN rod is the basic model of their range but it is probably the best entry level tenkara rod on the market. It is light weight and very well balanced, definitely better than any chinese made rod flooding the tenkara today. This rod is perfect with a Fujino tapered line to start your tenkara experience, even if you have never cast a tenkara rod before. Advised tippet: 号1.2 (19/100) maxi. This NISSIN "zoom" tenkara rod allows you to use it at two different lengths and this feature can really avoid losing many flies in overreaching branches. This rod will be very appreciated by the tenkara anglers who like tight rhododendron creeks as well as opened up streams. This tenkara rod is very light, perfectly balanced and very versatile. Wether you like fishing with wet or dry fly patterns this tenkara rod will follow you. Wether you like casting furled, tapered or level lines; nymphs, soft hackles or dries the Professional Kawashi rod will answer your needs. This rod is very polyvalent. This rod has been designed to make level line casting easier for beginner or intermediate level tenkara anglers. The tip has the flexibility of a modern tenkara rod while having a diameter slightly above average (0.8 mm) but it is partly solid and these features that makes the cast of level lines easy and accurate even if you do not do not perfectly master the gesture. This rod has a durable black EVA foam handle and its "camel back" shape makes it particularly comfortable. As always with Nissin the manufacturing quality is at the top. The Royal Stage Tenkara rod is a Nissin company's jewels, one of the best rod they ever produced. A new Nissin tenkara rod for the angler looking for convenience with short length. The Nissin Ramon rod is a very high quality tenkara rod that shows perfect performance with any kind of tenkara line on the market today. The manufacturing quality is also definitely above the rest. Perfect small stream tenkara rods. This beautiful rod was designed by Hiromichi Fuji, the father of modern day tenkara. It is an excellent rod to fish with and cast Nissin furled lines of which Fuji sensei is also the designer and manufacturer. Its handle is made of hinoki, a Japanese variety of cypress, very light wood, fine grain very pleasant in the hand and known to be almost rot-proof. If you want to practice the tenkara techniques of Fuji sensei and especially the famous sute-bari this rod really has everything to please you. For several years, Nissin has been working on the development of a tenkara rod with an ultra-short collapsed length to meet the demand of anglers and who wanted a rod that takes up as little space as possible. The challenge was to design an ultra packable tenkara rod with the performances of their best rods. This ultra-short rod (10 inches!) is the tenkara rod that meets this expectation of a very small collapsed size but with performance equal to other high-end rods of the brand. It is a high performance tenkara rod, not a gadget. Le sommet de la gamme des cannes tenkara Nissin; parfaitement équilibrées et d'une légèreté incroyable les cannes Zerosum vous donneront la même satisfaction quel que ce soit la ligne utilisée et que vous pêchiez en sèche, en noyée ou en nymphe. Si l'esthétique est très travaillée sur ces cannes la qualité de fabrication est elle aussi exceptionnelle. Nissin with this rod designed by Masami Sakakibara just offers the best tenkara rod ever made. 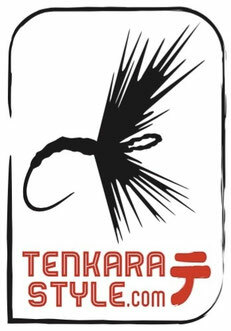 This 6:4 action tenkara rod is better balanced and has more backbone than any 13 feet tenkara rod on the market and has higher production quality than any competitor out there. Designed by Masami Sakakibara to fish big streams (Honryu) this one of a kind rod offers a powerful 6:4 action, is very light (only 100 grams!) and is better balanced than any 4 meters (or above) tenkara rod on the market to date. This awesome tenkara rod performs perfectly with tapered lines and level lines. Associated to Nissin Masami Sakakibara is redefining the performance standards of tenkara rods for the future.